Attachment theory has been subject to sustained critique by radical psychologists and feminists. The critical stance towards attachment theory among western experts is a matter of long-term analytical practices; neither the work of John Bowlby nor the popular socialist version of attachment theory by the Czech psychologists Zdeněk Matějčekand Josef langmeier has been the subject of such revision. Attachment theory still provides the key arguments in favor of deinstitutionalization and developing family placement in postsocialist countries. This obvious idealization of attachment theory by Czech psychologists limits access to the western critical tradition and blocks the deconstruction of Matějček and Langmeier. This essay attempts to overcome these limitations. A review of critiques of John Bowlby’s theory and his adherents is juxtaposed with a reconstruction of the history of attachment theory in socialist Czechoslovakia. In the first part, the essay embeds Western arguments within the concept of epistemic in justiceas developed by Miranda Fricker. In line with the principle of historicization, the next part explores the combination of forces that drove the formation of attachment theory in Czechoslovakia. The final part investigates contemporary attempts to apply attachment theory to the issue of forced removal of Roma children from their families and examines the options for preventing this practice and the placement of Roma children into residential care settings. In Russian. Schmidt, Victoria. 2016. “Attachment Theory in Action: Psychological Theories of Mother-Child Bonding in Postsocialist Czech Republic”. 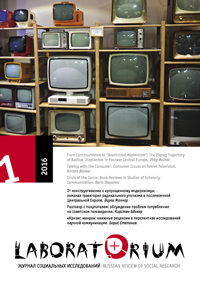 Laboratorium: Russian Review of Social Research 8 (1), 58–81. http://www.soclabo.org/index.php/laboratorium/article/view/596.